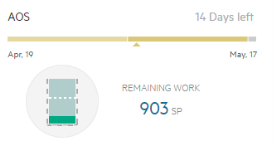 When you plan a release or a sprint, use the planning buckets in the Backlog module. Planning buckets are widgets that represent assigned work. As you assign items, ALM Octane refreshes the planning bucket to reflect the new contents. ALM Octane also updates the bucket if you change the item's phase, story points, and so on. In the Backlog, open the Planning pane on the right. Click the number of displayed releases to select the releases to plan. ALM Octane opens a separate bucket for each release you select. To view the sprint and team buckets, click the expand arrow beneath the release bucket. In the Backlog module, open the Planning tab and display the releases to plan. Select a specific sprint or all sprints. Into team buckets to assign them to the selected sprint and team. Drag stories to the No team bucket to assign them to a sprint without specifying a team. 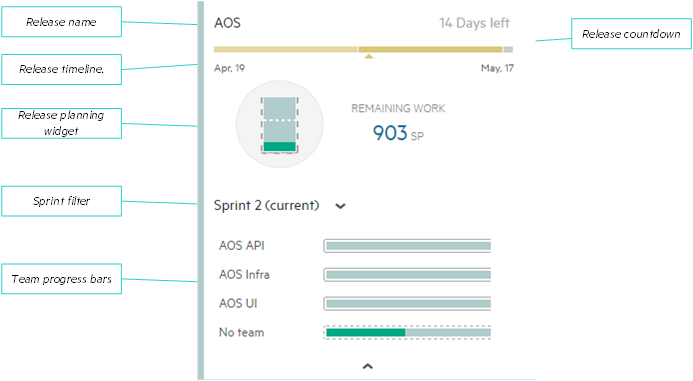 Drag items to a team in the All sprints bucket to assign them to a team but not a sprint. Caution: Assigning a feature does not assign its user stories, quality stories, or defects. The features, user stories, quality stories, and defects are now ready for work. What does the planning bucket display? Click to filter the grid and backlog tree by this release. This is helpful when you want to assign the release items to specific teams and sprints. Each bar represents a sprint. ALM Octane highlights today’s date and the current sprint. 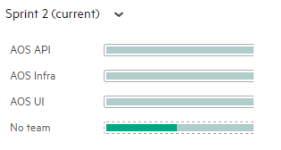 Displays aggregated data from the backlog items assigned to this release. Hover over the widget to see an explanation of each area. Select one sprint or all sprints. To assign backlog items to a sprint by dragging them into the sprint bucket, you must select a sprint. The progress of individual teams, in story points.